Image Size: 27"w x 34"h.
From the first American in space to the last flight of an Apollo aircraft, 24 Mercury, Gemini, Apollo, Skylab & Apollo-Soyuz astronauts signed Reaching for the Stars designating it a significant historical document. 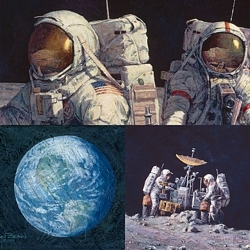 This canvas is an exact 3-D replica of the painting by Apollo 12 Moonwalker Alan Bean, making it an incredible piece of art. As a single document, Reaching for the Stars is one of the most fascinating and important records of the exploration of space you could possibly own. Five Mercury, eight Gemini, fifteen Apollo, six Moonwalkers,eight Skylab and one Apollo-Soyuz program astronauts all signed Reaching for the Stars. Such a record can never be created again. These are the men who visited the heavens at a time when the eyes of the world looked to space, the moon and beyond. Reaching for the Stars was created for the rotunda of the U.S. Astronaut Hall of Fame as an inspirational mural. In his work of art, you can actually feel and see the vestiges of lunar exploration. Just as with his original, your canvas features Alan Bean’s trademark “moonprints” of authentic lunar boots, impressions from a core tube-bit used to collect lunar soil samples and marks from a hammer used to drive the staff of the American flag into the Moon’s surface. Meticulously produced over a five months period, this textured canvas faithfully recreates the look and feel of the original painting—including the artist’s brush strokes—using a state-of-the-art combination of technological, artistic and craftsmanship skills. No other reproduction process compares in quality and value. The resulting fine art canvas is as close as you will come to owning the original work of art. Possibly not since the Declaration of Independence have two dozen great American heroes joined together to countersign and create such a historically significant work of art. In October, 1997, the astronauts came together for three reasons: to declare the expansion and renovation of the Astronaut Hall of Fame, to celebrate the induction of Apollo-era astronauts to the Hall (with Walter Cronkite as emcee) and to countersign Reaching for the Stars—specifically created to commemorate this once-in-a-lifetime event. the personal and individual signatures of each astronaut are written on the textured surface of this special, superior-quality canvas.